FILE - House Minority Leader Nancy Pelosi of California speaks during a news conference on Capitol Hill, Sept. 26, 2018, in Washington. Projecting confidence about her party's chances, Minority Leader Nancy Pelosi outlined five of the top 10 agenda items Democrats will pursue if they retake the House in next month's election. Lowering health care costs, rebuilding infrastructure, and running the House chamber with more transparency and openness are near the top of the Democratic agenda, Pelosi said during a talk Tuesday at Harvard's Institute of Politics. Democrats would also prioritize giving legal status to young immigrants, known informally as Dreamers, and strengthening background checks on gun purchases, she said. Democrats need to gain 23 seats to take control of the House from Republicans, something surveys suggest is within reach. "If the election were today, we would win the majority,'' Pelosi said. The California Democrat said she couldn't predict whether the election would be a "wave'' or "tsunami'' for her party, but said she expected it to triumph, putting her in line to regain the speaker's gavel. "I've never seen anything like the mobilization that is out there, the grass roots,'' she said. 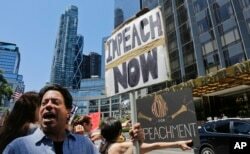 FILE - Protesters rally outside a Trump hotel to call for the impeachment of President Donald Trump, July 2, 2017, in New York. One item not on Pelosi's top 10 list: impeaching President Donald Trump. "I think impeachment, to use that word, is very divisive,'' she said. "Getting the documents and the truth — and where they lead us — that's what we have to do,'' she said. Looking ahead to a possible lame-duck session after the election, Pelosi indicated Democrats wouldn't relent in their opposition to funding Trump's proposed border wall. She said it would not be the best or most cost-effective way to protect the border. "It happens to be like a manhood issue for the president and I'm not interested in that,'' she said. One item she's personally hoping to add to the House agenda in the early days is the Equality Act, which would add protections for women and LGBT people to the existing Civil Rights Act. As Republicans fight to preserve their majority, some GOP leaders believe they have touched a nerve by linking Democrats to protests against Trump's agenda. They point to activists confronting senators in the Capitol hallways during the hearings to confirm Brett Kavanaugh to the Supreme Court. Senate Majority Leader Mitch McConnell of Kentucky has berated the "mob'' mentality as Republicans campaign to retain their majority. 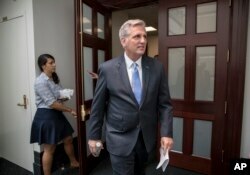 FILE - House Majority Leader Kevin McCarthy of California emerges from a House Republican Conference meeting on Capitol Hill in Washington, July 28, 2017. Democrats have distanced themselves from some of the more fiery rhetoric from their side of the aisle, including former Attorney General Eric Holder's suggestion that Democrats should "kick'' back. Pelosi in a letter earlier this week to her colleagues encouraged them to stay laser-focused on the agenda they're bringing to voters. She said Republicans have "intensified their climate of negativity'' because they don't have a record to run on. "In this final stretch, it is imperative that we remain positively focused on communicating our powerful message,'' Pelosi told them.